​... LEAVE MY SITE NOW! If You Are Still Here, You Have A Functioning Brain And Are Natural. Keep Reading. ​... Are You Training Regularly But Still Not Getting Stronger, Making No Progress, Getting Injured, Feel Stale, Tired, Lack Motivation Or Feel Stuck In A Rut? ... Do You Want To Re-Gain Your Enthusiasm And Maximize Your Strength Potential? If So, You Have Come To The Right Place! I Will Fix Your Training, Teach You To Train and Eat Smarter, Think Better, and Coach You to Success. Bob in 2017 on a Cape Cod vacation age 63. ​Do you want real personalized coaching and motivation? If you are an athlete and need to get bigger, stronger and more powerful ... or ... if you are a serious non-athlete who wants to get in shape, build lean muscle, build stronger bones or just feel younger, ... I Will Get You Back on Track and Better Than Ever! Most online training programs are the 'cut-rate' push button automated type. I don't automate my coaching and personally spend extra time speaking with you and writing to you daily. I speak and write directly to you and design your training program based on your goals, health history, needs, questions, feedback, and performance. Eight traits of online coaching BS ... that I don't do! 1. No software or 'one size fits all' training. 2. No coaching you by a pre-made video. 3. No toning, sculpting, or general fitness. No "Fake Strength Training" (bodyweight only, kettlebells only or bands). ​Only Real 'Old School' WEIGHT TRAINING. 4. No anonymously selected trainer from a stable of 'no-name' trainers or inner circle club membership. 5. No coaching from actors or former athletes with no academic background in exercise science. 6. No 'muscle magazine' Supplement Hype or training non-sense from DRUG USING bodybuilders/ strength athletes or any other PED users, (only food focused nutrition & steroid free philosophy). You'll never get the results you deserve by using routines that only work for drug users! 7. No forcing you to sign up for 3 months or even longer. Some clients only need a tweak. You can also get a one time consultation. 8. No Gimmicks - If you Listen, and are willing to do the work needed... You Can Not Fail. Now in his 29th consecutive year of strength coaching. Personal strength coach to athletes from the NFL, NBA, NCAA, Women's Professional Basketball, and various combat, strength & tactical athletes worldwide. No one is more qualified to train Tactical Athletes. I did it for 13 years. I was a US Air Force Fire Fighter for 8 years and a Federal Agent for 5 years before I turned my hobby and life long passion into my profession in 1990. "Get Out of Your Rut ...Let Me Coach You To Success!" 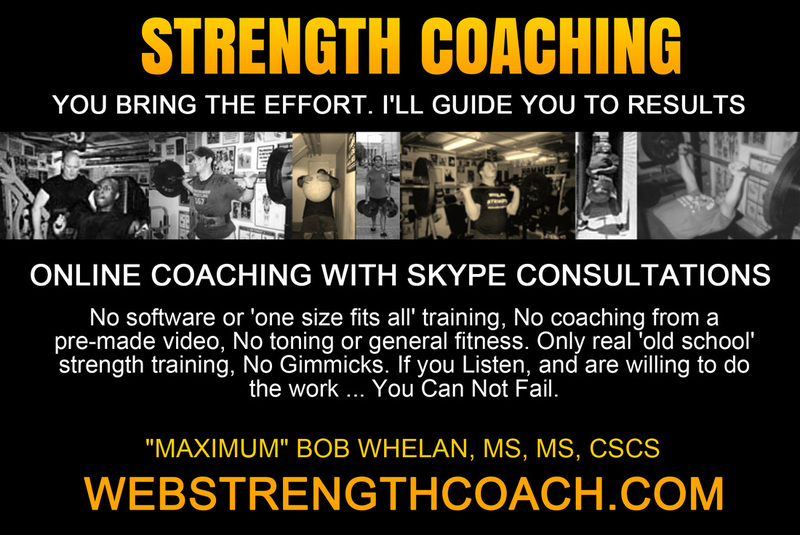 Bob Whelan: Masters Degree in Exercise Science and Health, Certified Strength & Conditioning Specialist (CSCS), District of Columbia NSCA State Director over 5 years. Former: Exercise Physiologist at NASA, conditioning consultant Boston Celtics, Strength & Conditioning Coach at Catholic University. Author of Super Natural Strength & Iron Nation, Writer & Columnist for Hardgainer magazine for 10 years, writer also for Hard Training (HIT Newsletter), Milo, The Dinosaur Files, The Iron Master and Natural Strength. Competed for 7 years and won many military & natural powerlifting contests. 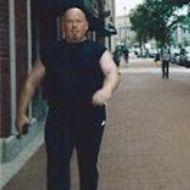 Transformation specialist, master motivator & owner of world famous Whelan Strength Training in Washington, DC for 22 years, ... and more, check about. Bob, Fix My Training and Get Me Back On Track! Compare Qualifications! Check both the "in the trenches" experience and EDUCATION not "certification". (A DEGREE in an exercise related field: exercise science, exercise physiology, kinesiology, sports medicine etc from a UNIVERSITY. Over 90 percent of personal trainers do not have an exercise science or related degree.) Beware of worthless certifications. Everyone is certified. There are over 200 fitness "certifications" in the USA and most of them are not worth the paper they are printed on, have no academic value, and can be easily obtained by anyone in weeks. There are many personal trainers loaded to the gills with steroids working at gyms who don't even have a high school diploma but are "certified" by someone. Also, if anyone claims to be a "nutritionist" be sure to ask if they are a REGISTERED DIETICIAN. Most states have no legal definition for the term "nutritionist."